The RM of Hanover has made arrangements for all residential solid waste to be taken to the City of Steinbach Waste Disposal Ground (N1/2 23-6-6 EPM), located a half mile East of PTH 12 on Hanover Road (south of Steinbach). The Council of The Rural Municipality of Hanover has re-negotiated its waste disposal agreement with the City of Steinbach. The Municipality of Hanover will continue to provide garbage collection & recycling services to the urban communities presently receiving that service. In the future, anyone (including Steinbach residents) attending the City of Steinbach waste disposal site will be required to pay a minimum fee of $10.00. The agreement with Steinbach is limited to urban residential garbage only. Hanover will not extend garbage collection and recycling services to rural areas of the Municipality at this time. Hanover will no longer pay tipping fees for residences outside of the present urban areas. Rural residents using contracted garbage collection services will pay a collection/tipping fee directly to their contractor. The Municipality will create service areas (Mitchell, Kleefeld, Blumenort, Grunthal and New Bothwell) and negotiate contracts for these communities. All services will be provided on a fee for service basis. Fees may be adjusted annually depending on the volume of garbage delivered to the Steinbach landfill site from each community. Please contact them directly if you have any questions or require their services. All vehicles entering the Steinbach Waste Disposal Ground must identify the location from which they are hauling. Residential waste will be accepted without charge. 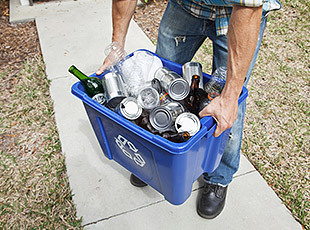 Waste from construction/renovation projects, yard clean up (such as trees and branches) and large volumes of waste may be subject to a tipping fee. All commercial waste is subject to a tipping fee. Please contact the City of Steinbach Waste Disposal Grounds directly at the number below if you have any questions regarding fees. For information on the Steinbach Landfill Facility, please go to their website. Newspapers - Including flyers and inserts. Aluminium Containers - Including all rigid aluminium containers. PET or #1 Plastic Containers - Including soft drink bottles, some food product and personal care product containers. HDPE or #2 Plastic Containers - Including milk jugs, some food product and some personal care product containers. LPDE #4 Plastic Containers and Lids - Including lids from containers normally used for margarine, yogurt and other food products. PP or #5 Plastic Containers - Including containers normally used for margarine, yogurt and other food products. #7 Plastic Containers - Including bottles sometimes used for ketchup and other condiments. Steel Containers - Including all steel food/beverage cans. Magazines/Catalogues - Including glossy paper publications. Gable Top Beverage Cartons - Including milk, milk product and juice cartons. *Important Notice: Please do not leave bags beside the trailer during non-operational times. Clean collected organic material can be taken to the City of Steinbach landfill or one of their community compost depots that are open every Saturday from the end of May until mid-October. For more information visit the City of Steinbach website. Spread materials like dry leaves, wood chips or grass on top of the soil, around plants and on garden paths. This helps to control weeds, retain moisture, and prevent erosion. The practice of leaving grass clippings on your lawn when mowing. This is an easy and convenient way to keep your lawn healthy and green. Mow high. Adjust the mower height to leave your lawn 3-31/2 inches long. Never cut off more than 1/3 of the grass height. Mulch it. Use a mulching mower to reduce the size of the clippings. They will break down and release nutrients to your lawn more readily. Keep it sharp and dry. A dull blade can damage grass. Sharpen mower blades annually and mow when the grass is dry. Alternate mowing direction. This keeps the grass from being pushed over in just one direction and being damaged by the sun.